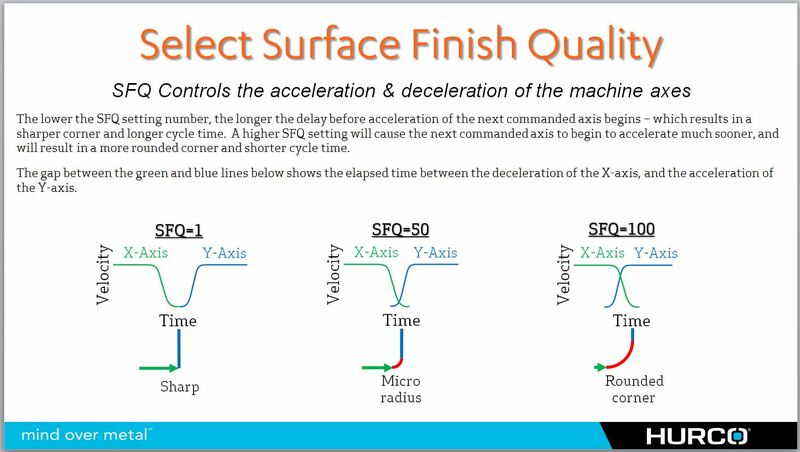 SFQ is a Hurco WinMax software feature that utilizes a user-definable control setting, and allows our customers to make a choice about which is more important to them on a particular project – a better surface finish, or a shorter cycle time. This setting is determined by entering a number between 1 and 100, and a good rule of thumb for this setting is: the smaller the number the better the surface finish, but the longer the cycle time. A larger number will result in a significantly shorter cycle time, but could produce a rougher finish. In addition to a “set it and forget it” parameter in the Program Parameter screens, this number can also be defined independently for different tools in a conversational program, and can also be changed as needed by using a G-code in an NC program. Therefore, whether you are programming the machine in conversational or NC, you can change the number based on current needs. For example: a roughing tool might use a higher number setting like 80, while a semi-finish or finish tool will need a lower number like 20. 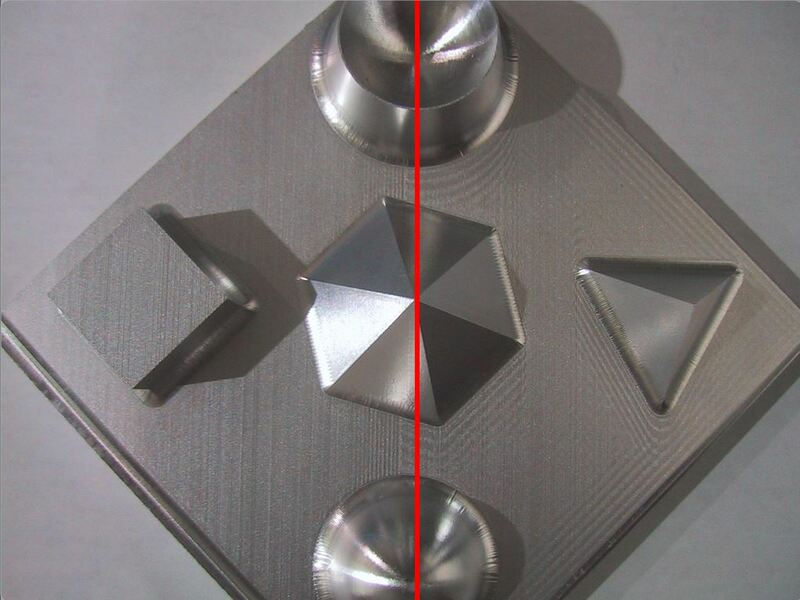 When roughing, we don’t care as much about surface finish, and just want to complete the process as fast as possible. However, during a finishing operation, the surface finish can be very important. Being able to make changes independently to both types of processes (roughing or finishing) provides the operator with the power to achieve the necessary part quality, but still keep the cycle time as low as possible…and SFQ will allow them the flexibility to make quick changes on-the-fly if necessary. So, how does it work, you ask? Basically the SFQ setting will impact the acceleration and deceleration of the axis drives, and when and how quickly direction changes will occur. When a right angle corner is programmed for example, and the machine begins to execute the necessary movements, it stands to reason that the movement of one axis (X-axis) must completely stop at some point, and the other axis (Y-axis) must begin to start moving. The current SFQ setting will determine how quickly the new movement begins, and how much of an overlap in time occurs before the old movement completely stops. For more content like this, please click the icon below to subscribe today !